Congratulations to our 2018 Volunteer of the Year: Laura Brown! Eventing competitions right up to the Olympics rely on volunteers to keep competitions fun, safe, and exciting. No prior experience is necessary; just a desire to get involved with a sport that celebrates horses and riders of all ages. Give us the chance to match you with the right job!! Waredaca provides an orientation each morning before the competition begins which will help in completely understanding assignments. Plus there are staff members and officials to answer questions and provide other details necessary to have a fun and enjoyable day. What a team we have!! Liz Schroeder remains our Volunteer Coordinator who can be reached at lizskips520@gmail.com. Jessica Jones is our Volunteer Support specialist, in addition to her Awards Chair duties. Linda Cosgrove is the recruit coordinator for our Goshen Hunt volunteers. Upon arrival, all Volunteers will receive a red Waredaca vest from your phase chair and are to wear it while doing your volunteer job. Wearing these vests will help our riders and visitors to identify you as a resource for information about the competition, the farm as well as recognizing you doing your job for the event weekend! You are a Waredaca Ambassador as well as a Waredaca Volunteer!! At each competition when Joni, the Smoothie Lady is here as a vendor…there will be 5 drawings done by Jessica Jones for smoothie coupons. Listen for your name!! AND a drawing for a $50 restaurant certificate for each competition day at the conclusion of every event! Be sure to check in to see who won! It could be YOU!! Continuing on the success of the Area 2 VIP program, the Waredaca Leaderboard will be in effect for 2019! Be sure to register your hours with Jessica Jones to ensure that your hours are properly credited to you. The volunteer with the highest number of Waredaca volunteer hours at the end of the year will receive $250 and our lovely perpetual trophy. USEA Area 2 will continue their VIP leaderboard too. See www.eventingvolunteers.com for details. Now is the time to get started! 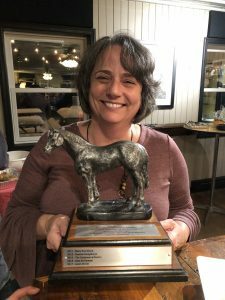 to be in the running for the Waredaca Volunteer of the Year and the USEA National Volunteer Recognition Program … sign up at the link above. Jessica Jones, at the Awards table near the corner show office, dispenses the Waredaca Bucks when you check out with her. Be sure to do so as this is the only time BUCKS will be available to volunteers—the actual day of the competition. There will be an expiration date on the BUCKS …for lessons and board-60 days from the date earned; for other services or options, i.e. XC schooling or logowear, 12 months from the date earned. This will strictly adhered to so please be attentive. work a full day of 8 hours and you get a FREE group lesson! Job opportunities are limited. If interested, contact Liz. Our head of Hospitality, Laura Brown, continues to keep us all happy with her cheerful smile and great ideas! Helen Casteel, our Sponsorship Chair has once again procured our sponsored Volunteer T-shirts! Always a limited quantity so be sure to sign up to volunteer soon rather than later!! These are available from Jessica Jones at the awards table. Thank you again for supporting us, each other and this wonderful sport of eventing!